DVL is part of the PECO Trade Ally program. We can provide guidance and assistance to maximize the PECO rebate for energy saving projects. PECO can help you meet the increasing demand for data storage while reducing energy costs. Data centers are one of the most energy-intensive building types, consuming 10 to 50 times the energyper floor space of a typical commercial office building. * They require redundancies in power and storage, as well as infrastructure to cool the equipment and manage the resulting waste heat. So they represent an important opportunity for making energy efficiency improvements. At PECO, we have the technical expertise and financial incentives to help your data center become substantiallymore energy efficient—and help you save money. Whether you’re constructing a new facility, planning a major renovation or looking to reduce the operating costs in an existing data center, we offer incentives for dozens of proven energy efficiency measures to make your upgrade projects hassle-free and affordable. From upgrading old equipment to installing new highefficiency systems and custom measures, we can help you find smart solutions to control your energy costs and improve your bottom line. 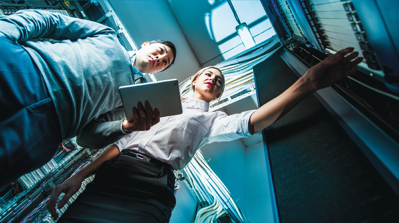 Read more about Solutions and Incentives for Data Centers.